The Foresters lost narrowly twice the week of Thanksgiving but look to recover as conference season hits full swing. Thanksgiving break was not kind to the men’s basketball team as they traveled to Asbury University in Wilmore, Kentucky, and suffered a loss on the heels of a a narrow defeat at the hands of Goshen in the Crossroads League opener. The Foresters jumped out to a quick lead Saturday and were beating the Asbury University Eagles by 12 points going into halftime. Huntington shot 66.7% from the field in the first half and enjoyed a 5-9 showing on three-pointers to go to the locker room with a convincing lead. Asbury showed much determination, though, and rallied back around the 14-minute mark of the second half when Asbury’s Deion Cochran made two treys to tie up the game at 68-68. The Foresters clung to their lead, thanks to baskets from Mason Coverstone and Mike Bush, who scored the next four points to pull ahead 72-68. The Eagles connected on two long balls to take the lead, which Huntington was unable to reclaim for the remainder of the game. The Foresters showed grit though, as they made it a two-point game twice in the remaining minutes, before the Eagles took over. Asbury exploded to go on a 13-4 run in the last two minutes of the game, resulting in a 98-88 score for the contest. Four Huntington starters scored in double digits, led by Bush with 20. He neared a triple-double as he posted nine assists and eight rebounds. Senior Daniel Woll poured in 19 points, backed by Austin Karazsia and Konner Platt, who each added 15. Asbury’s Trenton Thompson had a game-high score of 29 points. Huntington shot 56.3% for the game compared to Asbury’s 43.5%. The Foresters lost the battle on the glass, however, 45-41, and also had 23 turnovers compared to the Eagles’ 15. The two teams will meet again on December 10 when the Eagles travel to Platt Arena. Previously in their conference opener, the Huntington men’s basketball team let a twenty-one point lead slip away to the Goshen Maple Leafs in the Crossroads League conference opener Nov. 22 at Platt Arena. Huntington had a 21-point lead with 13 minutes remaining but hit a dry spell as Goshen (5-2) went on a 34-8 run in 10 minutes. The Maple Leafs found themselves with an 84-79 lead with just over three minutes left in the game. Huntington battled back with Devon Merder leading the charge. The junior guard scored four points in a one-minute span to bring the Foresters within three and to make it a one-possession ball game. Huntington, who entered the contest as the nation’s best free-throw shooting team, drew fouls and went to the line but could not convert for the points. The Foresters had two chances at the line to tie up the game, with the first coming with 22 seconds left on the clock. A 1-3 free throw conversion led to Goshen’s possession where the Foresters drew a charge and went back to the line with 17 seconds remaining. HU converted 1 of 2 free throws to combine for 2-5 within the last 22 seconds of the game. HU then had to foul Goshen and send them to the line, who converted 3 of their 4 free throws at the end of the game to close out the contest. The Maple Leafs posted a 94-90 win over the Foresters. 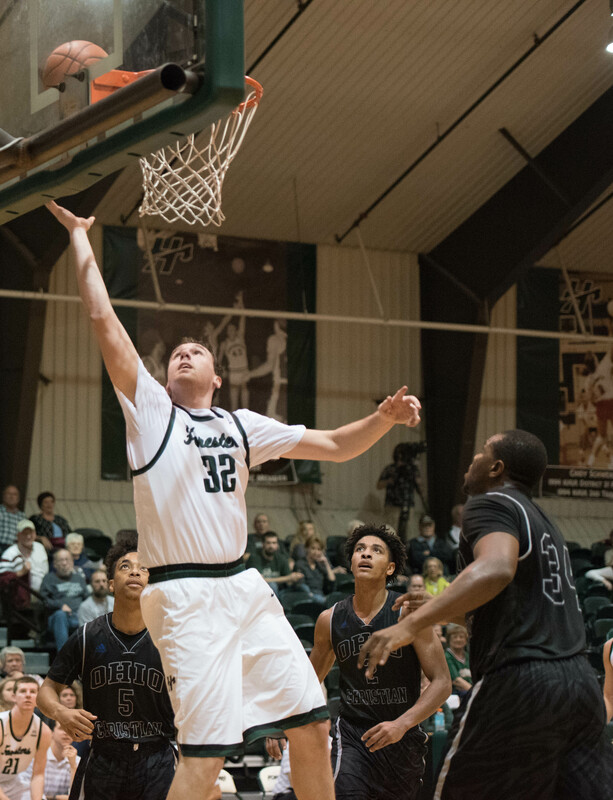 Huntington received balanced scoring as five Foresters scored in double digits. Merder led the crew with 17 points, backed by Karazsia, Bush and Tyler Arens, who each tallied 13. Woll posted 11. Bush, who is currently leading the nation with his assists-per-game average with 10.3, dished out an impressive 14 assists on Tuesday. Goshen also had five players score double digits for a balanced attack against the Foresters, led by Xavier Newson with a game-high 20 points. Huntington had a successful first half with a 59.4 field goal percentage while Goshen only made 41.7% of their field goals in the first 20 minutes. However, the Maple Leafs caught fire in the second half and shot 60% from the floor to end up at 50% shooting accuracy for the night. The Foresters struggled to shoot in the second half of the game and ended up 55% for the game. The Maple Leafs outrebounded the Foresters 36-27 in the contest and outscored them 13-7 on second-chance points. Huntington also suffered from turnovers, as Goshen was able to score 20 points off of Huntington miscues while HU only scored 7 points off of Goshen turnovers. The Foresters traveled to #16 Bethel Nov. 29 to try to secure their first conference win of the season. Merder has high hopes for the Foresters in their upcoming battles.